SYNTIVIA has developed CLOTHOLINE®, a completely new anti-aging active ingredient, after conducting an extensive cosmetic study using the Klotho protein, an innovative biomarker. 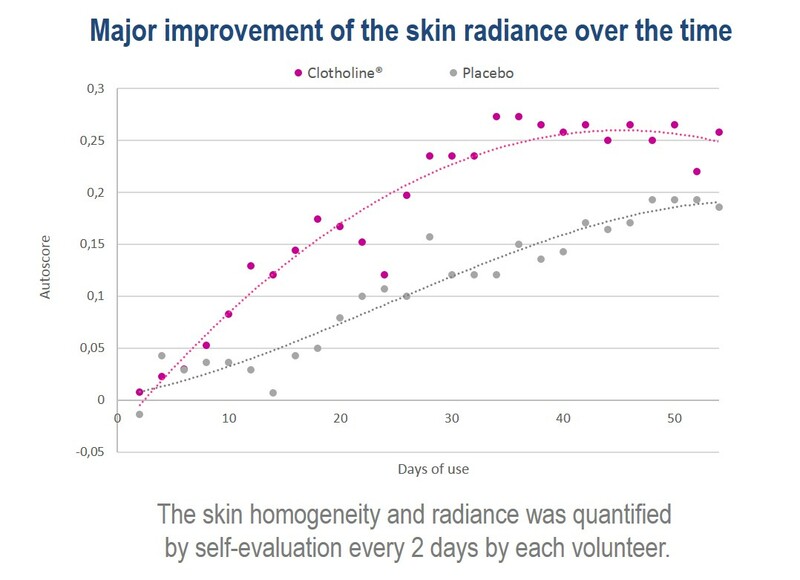 The study demonstrates that CLOTHOLINE® strongly increases Klotho protein synthesis and prevents aging by controlling cell metabolism to improve skin radiance. 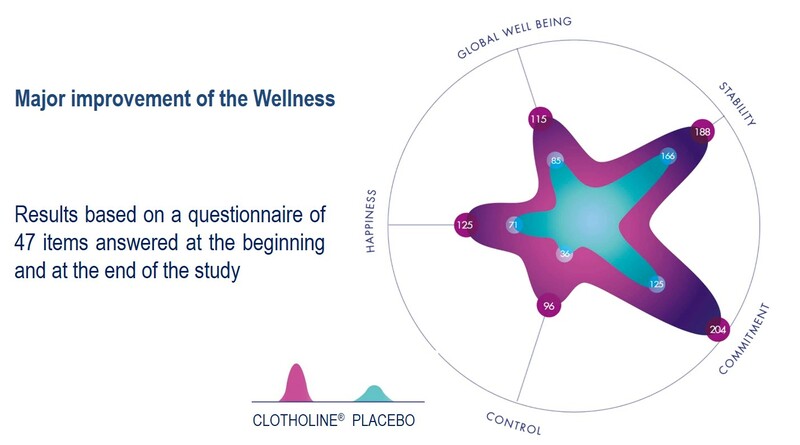 Our study also reveals that CLOTHOLINE® improves the sense of well-being in participants, which is a world-wide first for an active cosmetic ingredient. The Klotho protein derives its name from the Greek goddess who was held responsible for spinning the web of life in ancient times. It is also called the Youth Protein, as it is capable to increase lifespan when activated in a living organism. The Klotho protein slows down cell proliferation and ensures cell homeostasis. As it promotes cell longevity, CLOTHOLINE® preserves skin firmness, improves skin homogeneity and radiance, restructures the skin’s microrelief and decreases redness. 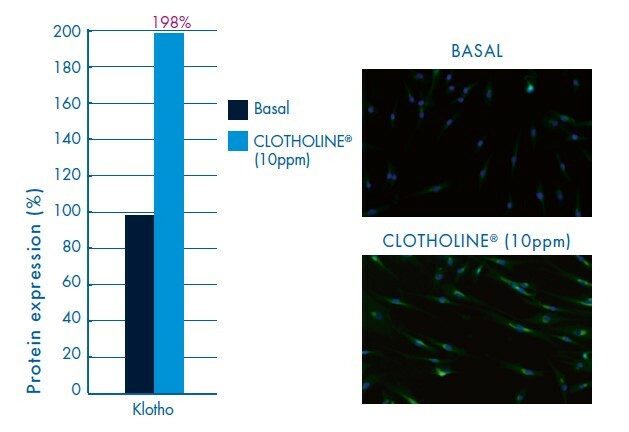 By boosting Klotho production, CLOTHOLINE® restores skin balance and revives radiance. This active molecule, developed by Syntivia for the account of SOLLICE BIOTECH, promotes a decrease in red spots* in 90% of volunteers, who also noted a marked improvement in the homogeneity of their complexion*. Repeated use of CLOTHOLINE® also helps maintain skin firmness*. The radiance observed by users is accompanied by an improvement in perceived well-being, happiness*, self-control* and commitment*. A recent study provides the first evidence that the amount of detected Klotho is sensitive to environmental influences, more precisely to chronic psychosocial stressors. The data revealed that women under high chronic stress had significantly lower levels of Klotho in comparison to low-stress controls and the rate of decrease of level was age-dependent. In addition, high-stress participants who displayed more depressive symptoms presented also low levels of Klotho (Prather et al, 2015).The link between Klotho and wellness seems to be evident and is supported by the results obtained with CLOTHOLINE®. SYNTIVIA’s expert team provides custom cosmetic studies to test and develop new and innovative active ingredients. Everything is done to optimize the results.